In this CSCW paper, we propose a novel approach to the design of algorithms, which we call Value-Sensitive Algorithm Design. Our approach is inspired by and draws on Value Sensitive Design and the participatory design approach. We propose that the Value Sensitive Algorithm Design method should incorporate stakeholders’ tacit knowledge and insights into the abstract and analytical process of creating an algorithm. This helps to avoid biases in the design choices and compromises of important stakeholder values. Generally, we believe that algorithms should be designed to balance multiple stakeholders’ values, motivations and interests, and help achieve important collective goals. In the paper, we described a case study “Designing Intelligent Recruitment Algorithms for WikiProjects in Wikipedia” to illustrate our proposed methodology. Step 1: Understand Stakeholder Values. There are three different types of stakeholders for this research — newcomers, current WikiProject members and organizers, and the Wikipedia community as a whole. To understand their values, we reviewed the related literature and conducted a survey. We collected responses from 59 organizers from 17 WikiProjects. 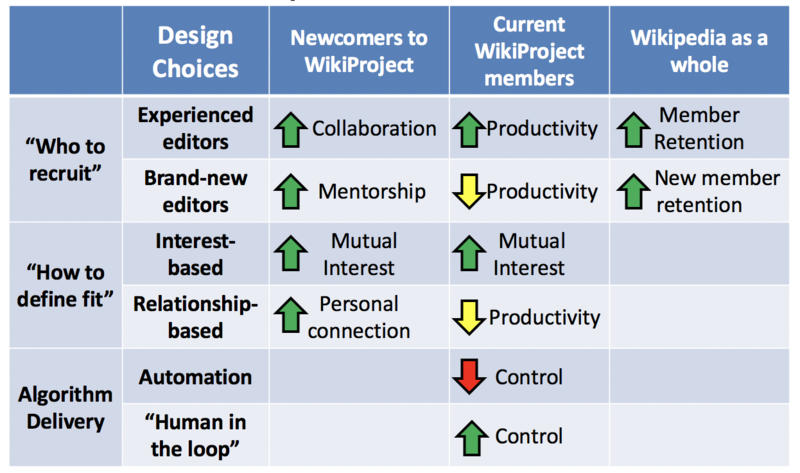 The table below summarizes how different design choices would benefit or harm stakeholder values. Step 2: Identify algorithmic approaches and create prototypes. we adapted the value dams and flows method to generate principles to guide the design of the algorithm prototypes. First, we removed design options that some stakeholders strongly object to, such as completely automating the process. Second, design options that some stakeholders find appealing (and others do not strongly object to) will be foregrounded in the design. For instance, although targeting brand-new editors who do not have editing experience is not the most appealing choice for WikiProjects, we still implement this option since it is strongly aligned with the whole Wikipedia community’s interest in retaining new members. We finally created four different types of algorithms: rule-based, category match, bond-based, and collaborative filtering. Step 3: Define methods for working with the community. Online communities like Wikipedia constitute a rich laboratory for research: they make collaboration, social interaction, and production processes visible, and offer opportunities for experimental studies. However, there is also an unfortunate tradition of academic researchers treating these simply as platforms for their studies, rather than real communities with their own norms, values, and goals. Wikipedia studies often encounter resistance from Wikipedia editors, and may sometimes be halted before completion. We avoided these problems by working with stakeholders to develop a research protocol that is acceptable to the community. We essentially developed our research plan and algorithmic approach in the Wiki. In other words, we are developing and deploying our algorithms not just for, but with, the Wikipedia community. Step 4: Deploy, refine and iterate the algorithms. We iteratively tested and refined our algorithms. Over a duration of six months we sent four batches of recommendations to pilot test participants, conducted short surveys to seek their views on these and also interviewed project organizers and newcomers. We used their feedback to make significant changes to the design of the algorithms. Step 5: Evaluate algorithm’s acceptance, accuracy and impacts. We evaluated the algorithmic system based on 1) whether they are Acceptable to stakeholders’ values, 2) Accurately solve community problems, and 3) have a positive Impact on the community’s outcomes and processes. Please check the paper for details. At the end of the paper, we discussed a number of key challenges involved in conducting value-sensitive algorithm design. At certain points, however, we might offer more questions than answers. Our hope is that this paper can contribute to the rich ongoing conversation concerning the use of algorithms in supporting critical decision-making in our society. Haiyi Zhu, Bowen Yu, Aaron Halfaker, and Loren Terveen. 2018. Value-Sensitive Algorithm Design: Method, Case Study, and Lessons. Proceedings of the ACM on Human-Computer Interaction 2, CSCW, Article 194 (November 2018), 23 pages.